A giant sea bass swims past Aquarium of the Pacific scuba diver Peter Croke on July 26, 2018. The endangered fish can grow bigger than a grizzly bear. Photo by Thomas R. Cordova. Researchers from UC Santa Barbara and the Aquarium of the Pacific are asking for the public’s help in spotting a critically endangered species of fish off the California coastline. On Thursday, experts in marine life gathered at the aquarium to launch the Spotting Giant Sea Bass citizen science program, created by the university in collaboration with the aquarium. The web-based project was described as a “Facebook for fish” by marine biology professor and director of the Benioff Ocean Initiative, Douglas McCauley. The website is a platform where researchers, recreational divers and even snorkelers can post photos of giant sea bass they’ve spotted off the coast. The fish have unique spot patterns on each of their sides, which the website’s algorithms—used previously by NASA to find star constellations—will match to identify their whereabouts. Once a common sight in the waters off Southern California and the gulf, these gentle giants are harmless fish that can grow to the size of an average grizzly bear and play an important role in maintaining the stability of kelp forest ecosystems. Severe overfishing almost caused their extinction, especially in the 1940s and 1950s when commercial fishers began using expansive gillnets to capture fish. 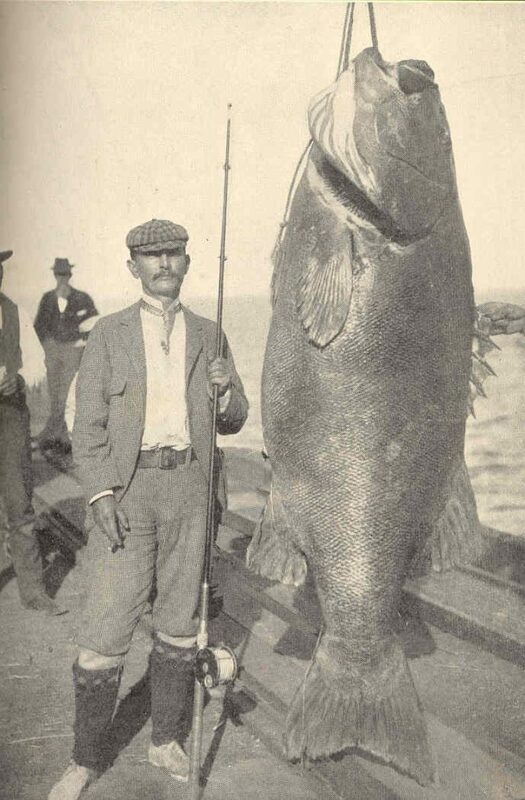 A state law passed in 1988 reduced the number of giant sea bass a fisher could keep if they are caught incidentally in a gillnet to one. Left: Photo taken by T.S. Manning on Catalina Island. Historic photos courtesy of University of California, Santa Barbara. Giant sea bass lack abilities to cope with overfishing because of their long lifespans—some live to 75, scientists said. The citizen science program is being introduced as the species makes its “first fragile steps to recovery,” said McCauley. Divers are currently spotting groups of sea bass near Casino Point, a beginners dive site off Catalina Island. The fish are attracted to many of the same sites divers enjoy because of their rocky reefs and high numbers of fish, which they’re happy to eat, McCauley said. It’s also their breeding season, said an aquarium official. “You can go down a set of stairs, put your face in the water and swim around with these giants, something that’s new and part of this good news recovery,” said McCauley. It’s a very slow recovery, however, as the first signs of positive growth were noticed about a decade ago, and the fish are still listed as critically endangered by the International Union for Conservation of Nature. The more people who contribute to the program, and the more often, the more raw data researchers can collect on the fish, including what habitats are important to them and what time of year they turn up. Researchers will also be able to quantify recovery efforts with more accurate estimations, all in an effort to keep this species around for longer, said McCauley. “Scientists have spent more time studying little tiny invertebrates in tide pools than they have studying these 500-pound giant sea bass,” McCauley told the Post. “Part of the reason is their rarity; they’re really hard to find underwater, so it’s really hard to do basic things like understand their feeding ecology. One study using genetics estimated the effective population size (number of mature breeding adults) of giant sea bass in the wild at 500, according to McCauley, although that number is very imprecise. McCauley said giant sea bass are worth $2.3 million for coastal economies if they’re alive and viewable by divers and tourists, for example. They’re worth about $12,000 if they’re dead. “They’re putting a lot more money into the economy by being beautiful and being big and being out there and being wild,” he said. Yutaka, a 2-year-old giant sea bass swims in its aquarium at the Aquarium of the Pacific. Yutaka is the first giant sea bass born at a public aquarium. Photo by Thomas R. Cordova. While there is still much to learn about the biology of these endangered behemoths, the aquarium has long been a haven for three of the species. 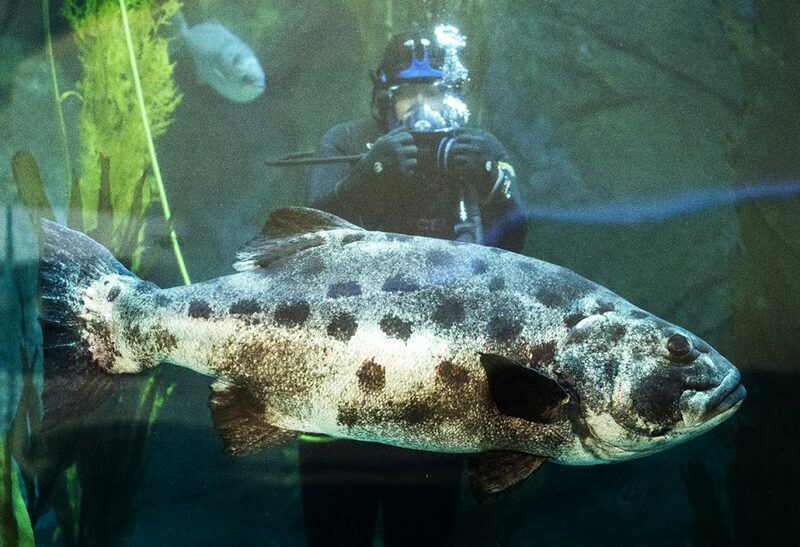 Two giant sea bass have been living in the aquarium’s Honda Blue Cavern under a special permit from the California Department of Fish and Wildlife since the aquarium’s opening 20 years ago. The third smaller fish arrived in 2012. Prior to the press conference, animal husbandry expert Sandy Trautwein pointed out a fourth fish, Yutaka, a juvenile sea bass living at the aquarium. 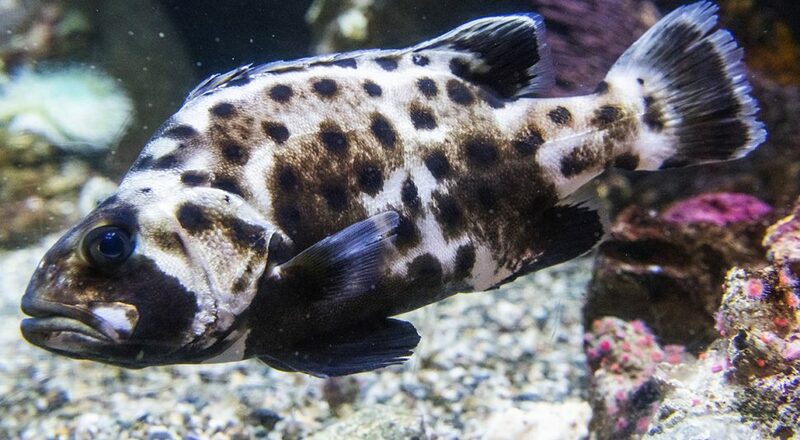 Yutaka, which is Japanese for “prosperous,” is about 2 years old and is the first giant sea bass to be hatched and raised at a public aquarium, ever. 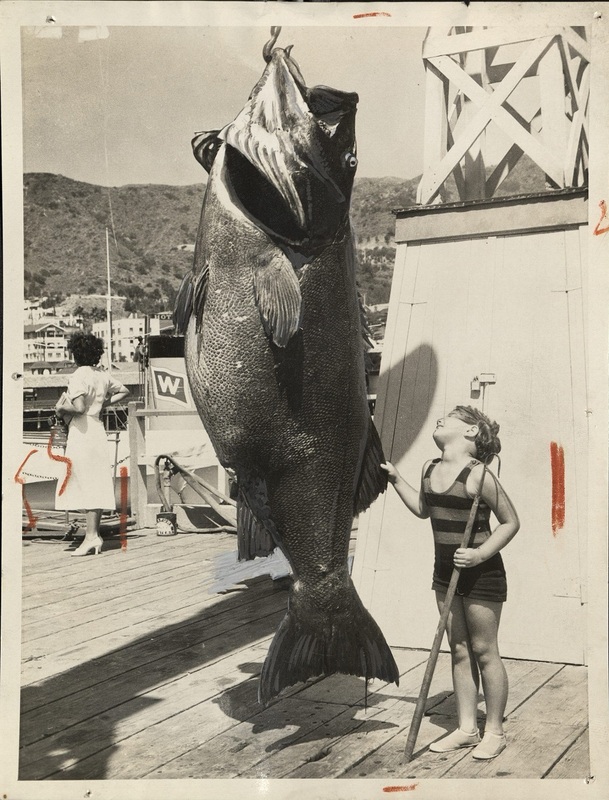 Learn more about the Spotting Giant Sea Bass project here.